Early in February an image was posted on Chinese website CJBDY showing a newly designed front-end frame and possibly an unmanned turret for what could be a prototype infantry fighting vehicle, IHS Jane’s reported. The authenticity of the picture has not been verified. If the reports are true, the prototype would likely replace the China North Industries Corporation’s ZBD-04, the defense-news outlet said. Infantry fighting vehicles are similar to armored personnel carriers, but are able to provide direct-fire support to ground forces. The primary differences between previous IFVs and the new prototypes is in vehicle design, as well as a newly-developed turret featuring a 100 mm primary rifled gun in addition to a 30 mm cannon, according to IHS Jane’s. 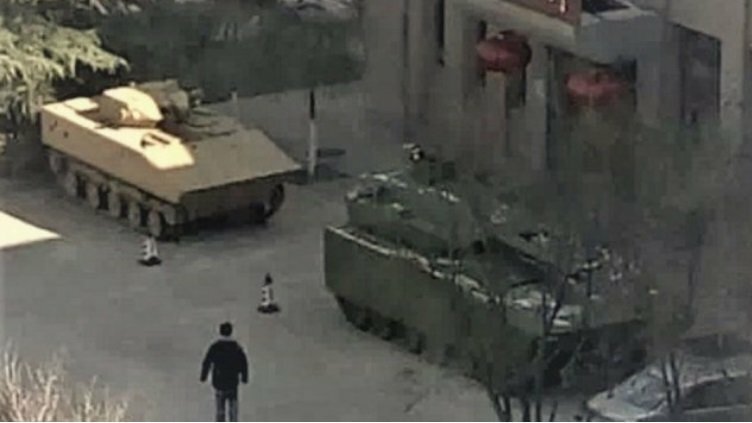 If the photograph depicts a secret IFV project, it would not be the only major military advancement Chinese officials are keeping under cover. The PLA has made significant strides in the development of an H-20 bomber that Chinese state media Xinhua said would “surely” be comparable to the B-2 Spirit stealth bombers that have been deployed by the US Air Force. The Chinese embassy in Washington DC did not respond to a request to verify the authenticity of the photograph. Critics remain skeptical of whether developments in the PLA’s arsenal are based on ideas originating in China. For example, the most expensive weapons program in US military history, the F-35 fighter jet, has been touted as a fifth-generation warplane. According to an NSA report, Chinese hackers made off with some 50 terabytes of data pertaining to the joint strike fighter, after accessing US defense networks. Military analysts have pointed out that elements of the F-35 have been incorporated in the PLA’s J-20 stealth jet.